You’ll be greeted by friendly and professional employees who will guide you through the simple process. All you need to do is wait for an employee to tell you to put your car in neutral, then sit back and relax. We’ll do the rest. We clean the vehicle’s exterior with gentle cloth washers and mild cleaning solutions. Your wheels and whitewalls will be cleaned, your vehicle will be rinsed and gently air dried – all automatically, in four minutes or less! Yes. For safety reasons, there must be a driver at the wheel at all times. Let ‘Er Buck Car Wash uses extensive lighting and a lot of windows to create a comfortable and open environment. Employees are always watching and will be available to answer any questions you may have. 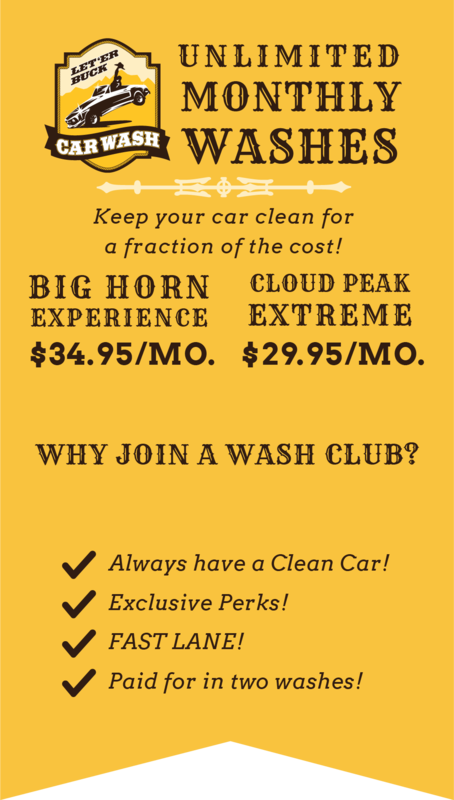 Let ‘Er Buck Car Wash offers “exterior-only” service. We do provide self-service vacuums. Free use of our ultra high suction vacuums is included with the purchase of any level of wash.
Our cleaning products are specifically created to be effective and safe.. They are biodegradable so, not only are they safe for your car, they’re safe for the environment! . It’s even possible that your vehicle was cleaned with the same products before it was delivered to you, since many major manufacturers use the same cleaning products, as the final step in the manufacturing process or to clean them after shipping. Yes. We proudly reclaim our water. By comparison, a study showed that the average person uses between 100 and 150 gallons of water when washing a car by hand, while our computer-controlled system uses only 35 to 45 gallons of fresh water for each wash, in addition to over 100 gallons of recycled water. We employ a brush-less process, using only soft foam that gently cleans your car in combination with safe and biodegradable shampoos and cleaners. “No Touch” operations, on the other hand, don’t use direct-contact cleaning media and may rely, instead, on acid-based chemicals. This is hard on the vehicle’s finish and can even etch glass and uncoated polished aluminum wheels. Some of these chemicals can be as unsafe for customers and employees as they are for the environment. Almost every vehicle fits in our car wash! If you ever have any questions, please feel free to come by and we will be happy to check your vehicle for problem areas. Vehicles with permanently affixed tripod style mirrors. 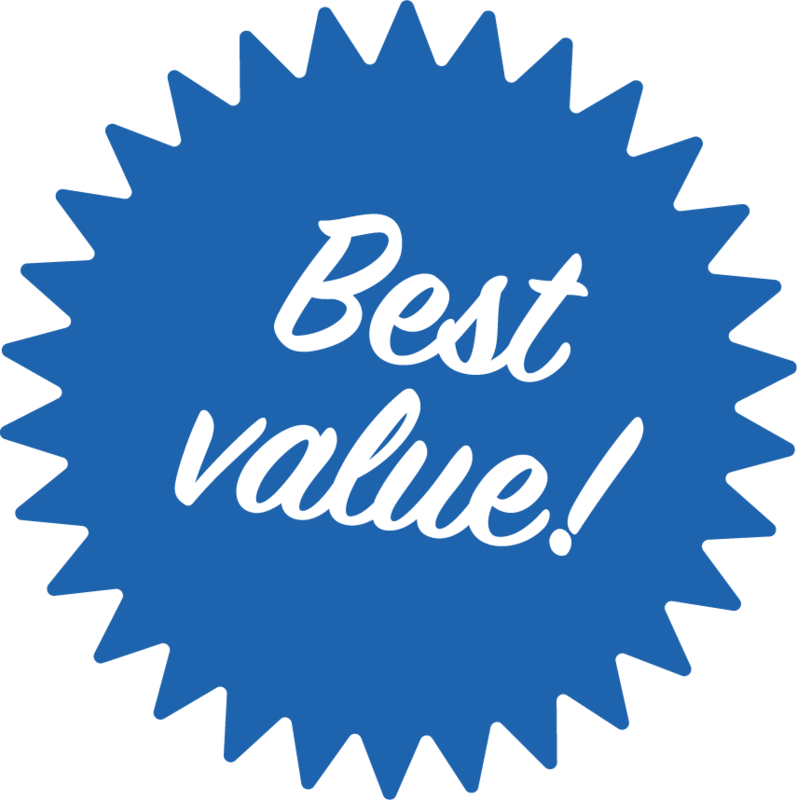 Any aftermarket parts (parts that are not put on by the manufacturer). We accept most cars, vans, and trucks up to 84 inches in height. Unfortunately, we cannot wash trucks with dual wheels. We are safe to wash all factory-installed equipment in proper working order. Almost certainly. All we ask is that the pickup bed be empty before going through the wash. This is for the safety of your vehicle and those of other customers’. Some oversized “trailering” side-mirrors are incompatible with our process, and certain types of modifications that employ over-sized or off road tires or radically raised suspensions may not be compatible. What about my Receiver Hitch? We ask, guests, to remove the hitch for best cleaning, if at all possible. Yes. Most carmakers caution against automatic washes that use acids on polished aluminum wheels, since these can stain. At Let ‘Er Buck we don’t use such acids so your wheels are perfectly safe. Yes, however, once the integrity of windshield glass is compromised by rock chips (even very small ones), it becomes more susceptible to changes in temperature. So, while you may wash your vehicle with windshield damage, the cracks or chips may expand. It’s always best to repair or replace a damaged windshield immediately. Aftermarket products, such as CB and cell phone antennas, should be removed before washing. Unfortunately, we can’t be responsible for aftermarket accessories made of plastic. Most customers who have bug shields wash their vehicles with no incident, however, problems can arise if the shield has already been damaged by rock chips, by stress cracks around the installation screws (which can be hard to detect), or if it is made from low-grade plastic. If you need a new bug shield, we recommend products made of Lexan, such as Lund® or Deflecta-Shield®, which are virtually indestructible. We cannot handle excessive mud caked on the vehicle surface. If you are unsure, one of our friendly attendants can help evaluate our capabilities.